California Community Colleges Guided Pathways is a multi-year process that helps colleges integrate multiple initiatives and scale up effective practices to improve student success. The California Community Colleges Guided Pathways model creates a highly structured approach to student success that: provides all students with a set of clear course-taking patterns that promotes better enrollment decisions and prepares students for future success and integrates support services in ways that make it easier for students to get the help they need during every step of their community college experience. Porterville College submitted their Guided Pathways Plan in Fall 2017. The Student Success and Equity Team will become the Guided Pathways Coordination Team and will be asking faculty and staff to participate in a variety of activities to facilitate the Guided Pathways work. 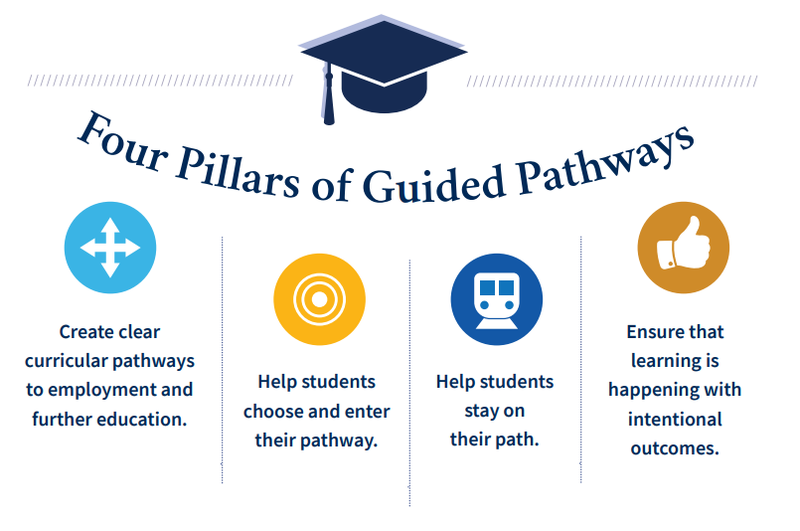 For more information about Guided Pathways, please review the resources files on this page. Implementation of the Guided Pathways at Porterville College takes the involvement of everyone on campus. Find documents and information about the Implementation Team on the Success and Equity Committee on campus.